Hi everyone! Today's look is sassy, edgy and bold! I wanted to feature patches, one of my favorite details in an outfit. Patches aren't in every single one of my outfits, but when they are I like to make them the spotlight of the look. To start off I'm wearing this classic crop top with some cool stitching detail. It's bold and has fun sayings like "I can't even", "hello gorgeous!" and my favorite, "No thanks!". It's super sassy and the colors and stitching make the top fun to wear. I paired this look with a boss bottom that are similar to the crop top but the details of the pants are patches and stitching. The pants are pleather, colorful, fun, high wasted, and look super chic and goes well with the cropped top. 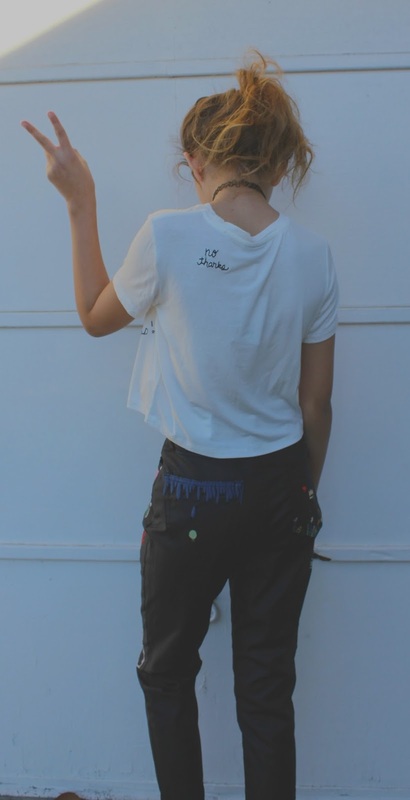 Some of my favorite details on the pants is the rainbow sun, "day dreamer" and "the world needs all kinds of minds." I purchased this outfit from Nordstrom by Topshop. I loved the sass the outfit has, so I wanted to continue that vibe onto the shoes. I stepped into these pink fuzzy slippers that are so in right now. You can wear them around the house or out and about. The slippers are from a cute on-line boutique called GoJane, the brand is Wild Diva Lounge Shoes. I completed the look by wearing a super edgy choker and wore my hair into a simple ponytail to show off the necklace as well as the detail of the crop top in the back. I feel really comfortable in this outfit and could wear it to my friends house or wear it out to dinner. Don't be afraid to express yourself with this outfit and dare to be different.